City Councilwoman Jan Perry has introduced a motion asking the council to force the Department of Building and Safety (DBS) to issue a permit for a 100 ft. high, double-sided electronic sign on the west side of the 110 freeway downtown. The department has refused to issue the permit on the grounds that the municipal code prohibits signs within 2,000 ft. of a freeway if they are primarily visible from the roadway. The department also claims that the 1,100 sq. 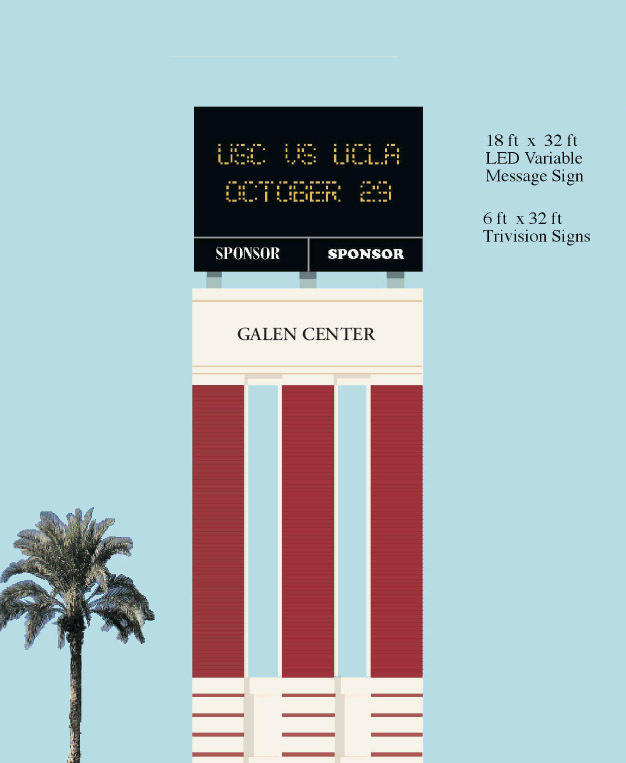 ft. sign proposed for advertising events at USC’s nearby Galen Center would violate the current moratorium on new off-site digital and supergraphic signs. In addition to the electronic display, the sign will include two non-electronic “tri-vision” or rotating signs carrying the names of founding sponsors of the center that opened in 2006 as a venue for USC basketball and other university events. Whether or not those names would be of corporate sponsors that helped fund the $140 million facility hasn’t been publicly disclosed, and the City Attorney’s office hasn’t rendered an opinion on the question of whether such corporate names would make it an off-site sign and thus subject to the moratorium. The motion by Perry was made yesterday under council rule 16, which means it will bypass any committee hearings and go directly to the council floor as soon as it can be legally agendized. Both the DBS and the city Department of Transportation have rendered opinions that the sign is primarily viewable from the freeway. However, federal judge Audrey Collins ruled last year in the World Wide Rush v. City of Los Angeles case that the freeway proximity and viewability provision of the code was unconstitutional. That ruling, which also found the city’s off-site ban unconstitutional as applied to a number of the company’s supergraphic signs, is currently on appeal to the 9th Circuit. A conditional use permit allowing the sign was originally approved in 2004, but that permit specified the sign’s location as Figueroa St. a block to the west. The city planning department later issued a “clarification” changing the sign’s location to Flower St., much closer to the freeway. No notifications were made or public hearings held on this change. 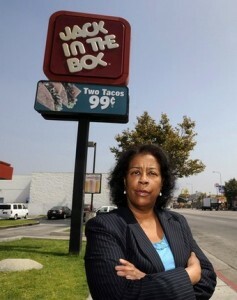 An Environmental Impact Report approved prior to the conditional use permit did specify the sign’s location as adjacent to and viewable from the freeway.